Coll. No. 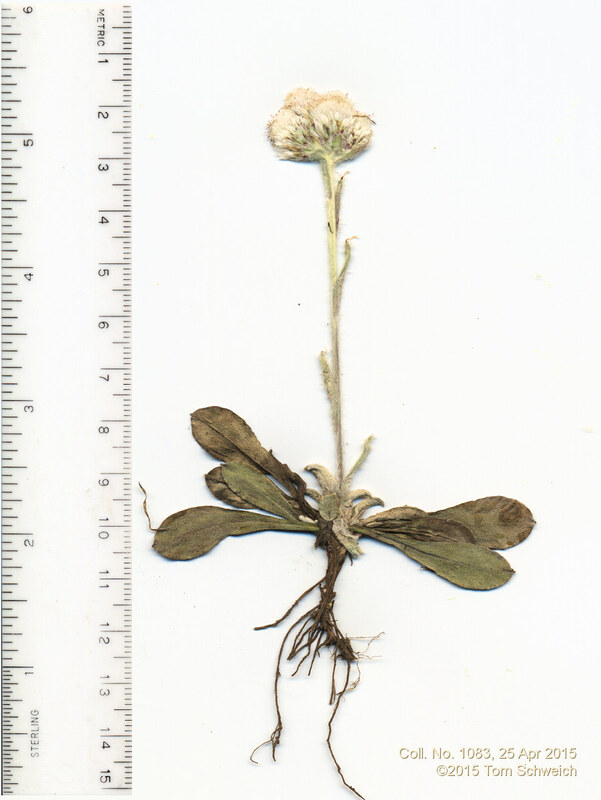 1083, 25 April 2015, characters observed: Perennial herb, to 9 cm., stoloniferous 4-5 cm., forming loose mats in wet muddy soil, all sixteen plants collected pistillate (gynoecious? ); Leaves, simple, white tomentose both sides, basal, 35 mm. × 9 mm wide, oblanceolate, cauline, 11-13 mm., linear; Inflorescence, >> basal leaves; Involucre, 5.5-7.0 mm. ; Bracts (phyllaries), 5.0-6-5 mm. × 1.1-0.7 mm. wide, green at base, purplish band in middle, tips, white, scarious. Field Notes: Coll. No 1083, 25 Apr 2015.